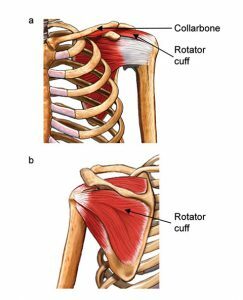 This page will provide you with information about rotator cuff repair. For further details, please speak to your consultant. A group of four muscles and tendons form the rotator cuff, which connects your shoulder blade and your arm. You might experience pain in your shoulder and / or a lack of mobility in the joint, due to impingement or a tear to the rotator cuff. Surgery can help by repairing tears or the impingement, making it more comfortable use the shoulder normally. Options include drug treatments (such as painkillers and anti-inflammatories) or injections into the shoulder (using steroid or local anaesthetic). Sometimes physiotherapy and changing the way you do things is the best alternative to surgery. If there is a large tear, alternatives to surgery might not be effective. Shoulder surgery usually takes up to an hour and is done with an anaesthetic. Anaesthetic options will be discussed with you. The surgeon aims to release any impingement, usually by keyhole surgery or arthroscopy. This method involves shaving off some bone and removing thickened tissue. Repairs to the rotator cuff might require open surgery, or keyhole surgery might still be an option. The technique re-attaches the rotor cuff to the bone using stitches. Usually patients return home after one day. You will need to get stitches and clips removed by your GP or medical staff after about a week. Regular exercise is recommended to help you return to normal as soon as possible. You should ask your GP or a member of your healthcare team for advice about when to begin exercising again. You should be able to perform normal activities using your shoulder within a year, though it might take longer to regain full strength. There is also the possibility that symptoms will return. You might consider surgery to ease shoulder injuries that are causing you pain and weakness, so that you can carry out normal activities again. Please be aware that problems can come back in the future.